I’ve been in a veritable frenzy of pickling the past couple of weeks. Before that, there was a good stint of jam-making. I’ve had a brilliant run. I’ve been able to run a full canner-load almost every time, every jar has sealed, and the jam has been the perfect consistency. Until two days ago, when a jar of dill pickles exploded when it was lowered into the canner. Then yesterday, I ran fifteen jars through the canner, and FIVE of them didn’t seal. What? FIVE? I never have that sort of failure rate. I did what I always do though, upon reflection, maybe my lids or jars weren’t quite as hot as they should have been, because I was doing two batches at once, and my attention was divided. 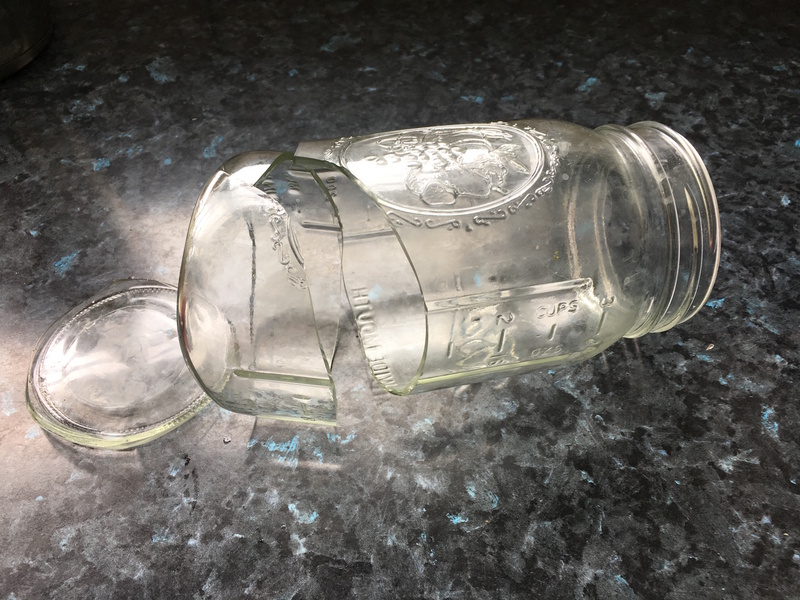 Today I reran the five unsealed jars, making sure they were nice and hot, and they all dutifully sealed. But it made me think about failure and my response to it. I fail a lot. I have hundreds of rejections of my writing from agents and publishers. I’ve thrown away entire rounds of cheese that just didn’t work properly. I’ve made loaves of bread that could be deadly projectiles. I’ve made birthday cakes that didn’t look anything like what they were meant to be. I’ve taught lessons that have flopped completely. I’ve made clothes that have gone immediately into the rubbish upon completion. The list of my failures goes on and on. When we fail, we have a number of options. Option 1: We can pout, blaming our failure on the weather, the phase of the moon, the person next to us, the wrong tools, millions of illegal immigrants, or whatever. This might make us feel good, because it allows us to pretend our failure was not our own fault. But it doesn’t make us likely to succeed next time. Option 3: We can critically analyse what went wrong. Maybe it was poor tools–I’ve had cheese fail when a thermometer was inaccurate. Maybe we got sloppy–I’ve ruined garments by rushing to finish them. Maybe we didn’t understand enough about what we were doing–the first time I taught preschoolers, they chewed me up and spit me out, because I had no idea how they related to the world. Analysing our failures takes time. It requires a willingness to critique ourselves in an honest and constructive manner. It requires us learn new things. It requires us to get back on that bicycle and try again. But it’s the only option that leads to success.